These Bhutanese love stories intersect in a refugee camp and land in Colorado - Denverite, the Denver site! Oct. 31, 2016, 12:00 p.m.
Om Sapkota met Doma Kafley-Sapkota in a place their son may never understand. Bidur Dahal and Punya Rai Dahal were destined for marriage, until the great upheaval happened. This is one story about two couples. It’s about four people on a long and strange journey from Bhutan to the refugee camps of Nepal to New Zealand and finally to Colorado. Like all love stories, it’s about culture, coincidence and the way they change our lives. Check out the video below for the short version, or continue on to read our feature. Here’s the scene: Thousands of bamboo-roofed huts line a river in eastern Nepal. Black coal smoke and the scent of cooking rice drift up toward the hills. “It smelled like boiled rice, all the time,” Doma remembers. She was 24 then, and this was how it had been for the 16 years since she arrived with her family — years without electricity, years of boredom, years wondering about life back home in Bhutan. But this was the day it was going to change. The camp was going to close, and Doma’s family had been selected as the first to leave. All the people of the makeshift village crowded to watch their departure. The caravan arrived on the camp’s only main road — four Jeeps and a white bus marked with the letters IOM, the International Organization for Migration. “Nobody knows what is going to happen, whether we’re going to see each other again,” she recalls. The destination was New Zealand. Om barely knew the girl who left. He used to see Doma up on the bluffs across the river, where all the kids climbed to do their homework before night fell. Their fathers were good friends — they would walk together for long evenings — but Om and Doma themselves had spoken only a couple times before the exodus began. Romance wasn’t all that common in the camp. Marriage is precious in Bhutanese culture, but interaction between young men and women is limited. In any case, Om wasn’t around camp much those days, including the day Doma’s family left. He had found some escape in education, traveling hours by bus to an Indian university. But he was curious, of course, about what would become of Doma as she and her family stepped out of the camp’s purgatory and into the developed world. Rumors abounded. There were no firm answers, but Om would know soon enough himself. Within months he’d be heading in the opposite direction: His family would move to Colorado. Om and Doma’s refugee camp was one of seven spread across Nepal. For nearly two decades, these camps housed more than 100,000 people. Most were Nepali by heritage and Bhutanese by birth. They had suffered a “systematic eviction” from Bhutan, as Global Bhutanese Community Colorado described it. Some were waiting all those years for a “call for repatriation,” a reason to return to their country, but it never arrived. 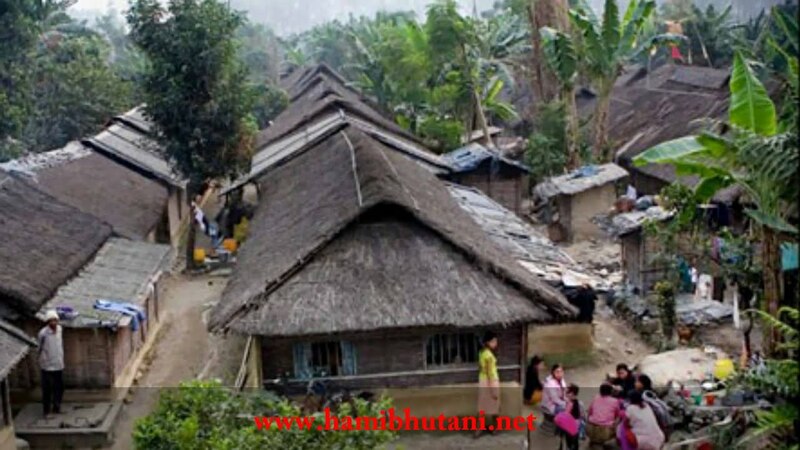 For Doma and Om, the impermanent life of the camps became teenage years and adulthood. “People were just sitting there. No jobs, can’t leave — relying on the food, given by somebody else, on a scale –– food given on a scale,” Om says. It took some 16 years for the international community to make a plan for these people. In 2007, a group of eight countries finally agreed to accept the refugees, from New Zealand to the United States. Today, there are some 2,000 Bhutanese immigrants living in Colorado and 85,000 total in the United States. This is when one love story turns to two. Om was practically alone when he arrived in Denver. He was awed by the size of the city and especially the way it was organized. He figured out pretty quickly that streets run north and avenues run west – but he still had to learn a thousand cultural rules and unfamiliar systems. Luckily, he had a friend: Bidur Dahal. Bidur and Om had met years earlier in India, where they were neighbors for some time. Bidur also was driven from Bhutan as a refugee. He had taken a different path through the diaspora and landed in Denver a month earlier than Om. Why? Because it was this chance reunion with Om in Denver that would lead to his own marriage. Om, remember, used to know a young woman named Doma, the first to leave the refugee camp. Doma’s family had moved to New Zealand, where they lived next door to another Bhutanese family — including another young woman named Punya. Punya, in turn, was an old flame of Bidur’s. They had lived next to one another as infants in Bhutan. Their families were close enough that the two probably would have had an arranged marriage, except that the purge had totally scrambled their lives. They had met again as teenagers in a refugee transfer camp, where they talked for days before being sent to opposite ends of the earth: Denver and New Zealand, just like Om and Doma. After a few years in the United States, many of the immigrants were ready for a reunion. Everyone spent the first couple of years getting used to life in their respective new cities — the men (Om and Bidur) in Colorado, the women (Doma and Punya) in New Zealand. In 2011, Om got a call. It was from Doma’s father. He had recently figured out how to use a calling card. “Since we were connected so much in the camps, we always had concern: How’s that guy doing? How’s that extended family doing?” Om says. Soon, Om and Doma’s families had arranged for a visit in New Zealand. Om’s friend in Denver, Bidur, would come along for the trip too. This was an amazing thought. Their families had been non-citizens for so long, transcontinental travel having been unimaginable during their years in the camp. What’s more, they had always feared that the end of the camp would mean the end of their community. “My friends, they cried in front of me saying this is the last time that we are going to meet,” Om said, remembering his last days at the camp in Nepal. And here they were, boarding a plane from Denver International Airport to the other side of the world. Neither Om nor Bidur knew that this trip would set both of their marriages in motion. Let’s start with Bidur, the younger of the two men. He thought, at most, that he would stop by and see his old love interest. In a different life, he and Punya would have been married already. Bhutanese fathers love to unite their children, and their fathers had been friends. But the years and the miles had left them out of touch. Bidur realized, upon their reunion, that he had been a fool. Meanwhile, big things were being set in motion for Om and Doma, whose families had arranged this whole trip: Their fathers were discussing an arranged marriage that would come to be some two years later, in 2013. Today, they all live happily in Colorado. Both couples are married now. Om and Doma live in Aurora, on Himalaya Court. Bidur and Punya live in Colorado Springs. They arrived at their new lives through somewhat different routes, but the result is the same: For both couples, the tradition of marriage was a way to rebuild their culture in their new homes. “We kind of became the model,” says Doma, now working at the front desk of a hospital. For their parents, fulfilling the tradition of arranged marriage was a thing to be proud of, a sign that they had survived it all. Om and Doma have a son now, 2 years old, a kinetic little kid. Vineet will grow up with three cultures, in a way. He’ll see relatively little of Bhutan as he grows up — a set of brass plates in the kitchen cabinet, passed down from his great-grandfather, are practically the only family heirlooms — but he’ll have the traditional family structure, his grandparents and parents in the same house. The child will also be an American, obviously. And then he’ll hear stories of a third place too: The refugee camp. “My dream is to take him and teach him sometime. I will take him to the refugee camp. I will tell him, this is where I had my hut, and this is where my mom used to live,” says Om, who works as a translator for a hospital. Bidur and Punya talk about their marriage a little bit differently. Their engagement was more Western, arranged by themselves rather than their parents. Punya’s folks are back in New Zealand, while Bidur’s parents have split up. Even so, the young couple’s relationship has grown to fulfill that same cultural role. And still they face the same questions that any immigrant does, even after the travels and the hardship: Who will we be now?